Pickett practically invented steer wrestling. The rodeo star, who died in 1932, is honored on a U.S. postage stamp. For a three-dimensional tribute, check out his action statue in the Fort Worth stockyards. Here, the “History Detectives” share what they learned when they investigated Bill Pickett’s saddle. Was it his? 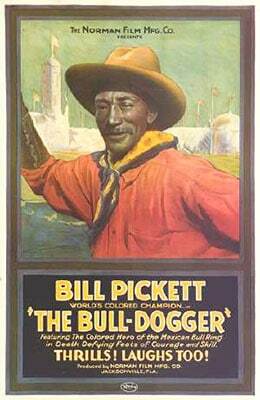 You can even watch film footage of Mr. Pickett roping a steer in the movie “The Bull-dogger,” made in 1921.